Capitals Questions 2: Will the Caps Miss Mike Green? This is the second in a series of articles leading up to training camp detailing the most pressing questions facing the Washington Capitals heading into the 2015-16 season. 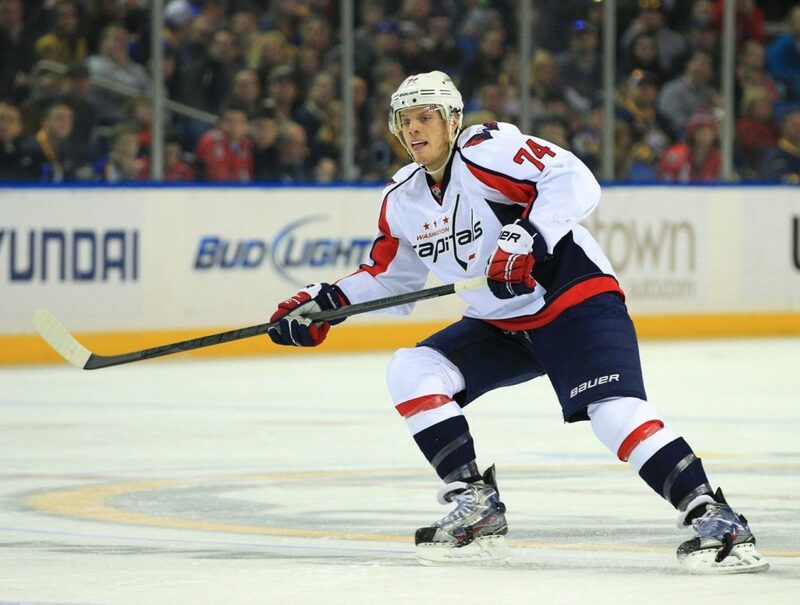 Capitals Questions: What Happens to Brooks Laich and Jason Chimera? It’s the hockey question of the year in D.C.: How much will the Washington Capitals miss Mike Green? And if you ask 50 Caps fans, it’s likely that you will get 25 who say the team won’t miss Mike Green at all and 25 who will tell you that the club can’t replace him. The truth, as usual, is probably somewhere in the middle. Perhaps no player in Capitals history was more polarizing than Mike Green. Electrifying one moment and infuriating the next, he was a once-in-a-generation offensive talent on the blue line who was prone to defensive miscues. But Green was a huge part of Washington’s reemergence from the depths of NHL obscurity, turning in head-shaking, record-breaking offensive performances that twice earned him Norris Trophy-finalist recognition. And his puck-moving ability on the power play allowed the Caps consistently to rank among the league’s top extra-man units and helped Alex Ovechkin become and remain the world’s top goal-scorer. In 575 appearances with the team Green compiled 52 goals and 111 points with the man advantage – both of those numbers ranking near the top of the league among defensemen during that period. And no one, NO ONE, can deliver the puck to Ovechkin’s sweet spot like Green can. There’s no doubt that Green was the very definition of high risk, high reward. His defensive-zone turnovers and occasional positional lapses in his own end caused many Caps fans to call for him to be traded throughout his time in D.C. – even during the best years. A series of physical setbacks, including head injuries, slowed Green in recent years and limited his ice time a bit, but in a way it seemed that the injuries also helped him mature and learn how better to play within himself. Last season Green reinvented himself as a third-pairing defenseman, seeing his overall minutes cut but again leading Caps blue liners in power-play time at an average of 2:45 per contest. The end result was another solid offensive season of 10 goals and 35 assists to go along with an impressive plus-15 rating in 72 games. But that fell off to 0-2-2 in 14 playoff contests, which combined with a couple of bad penalties in the heartbreaking Game 7 loss to the Rangers to bring all the Green haters back to the social media forefront. This time, with the 10-year veteran approaching unrestricted free agency, the team agreed that $5 or $6 million per year was just too much to pay for a fifth defenseman. So Green has moved on to the Detroit Red Wings, where he should settle in nicely on the power play and probably crack one of their top-two defensive pairings. His minutes will go up, and he still should excel on the power play. Articles and blogs out of Detroit have proclaimed that Detroit is better on the blue line with Green. Many in the D.C. area also have said the Caps will be better without him. Funny how that works. The reality is that Washington will be different without him, and whether that means better or worse remains to be seen. For starters, most would figure that the Caps’ power play will be a little less efficient – at least at the start of the season – without Green. But the cupboard is far from bare, and the reality is that the team might not miss a beat with the extra man. Can Carlson Pick Up the Power-Play Slack? Veteran John Carlson averaged about 1:45 per game with the man advantage last season and recorded career bests of 12 goals, 33 assists and 45 points overall, including 3-13-16 on the PP. And while statistically Green had more primary assists than Carlson on Ovechkin power-play goals, most of the other analytics such as team power-play shot attempts per 60 minutes, Ovechkin power-play shot attempts per 60 minutes and point power-play shots per 60 minutes (and point power-play shots on goal per 60) all favored Carlson over Green during the regular season – and by a substantial margin. In addition, Matt Niskanen has proven to be an effective point man on the power play during his career, recording three goals and 15 assists with the extra man two years ago for the Penguins before notching 2-8-10 last season in 1:03 of power-play time per contest in Washington. And waiting in the wings to potentially assume a role on one of the Caps’ power-play units is 24-year-old Dmitry Orlov, who missed all of last season with complications from a wrist injury. 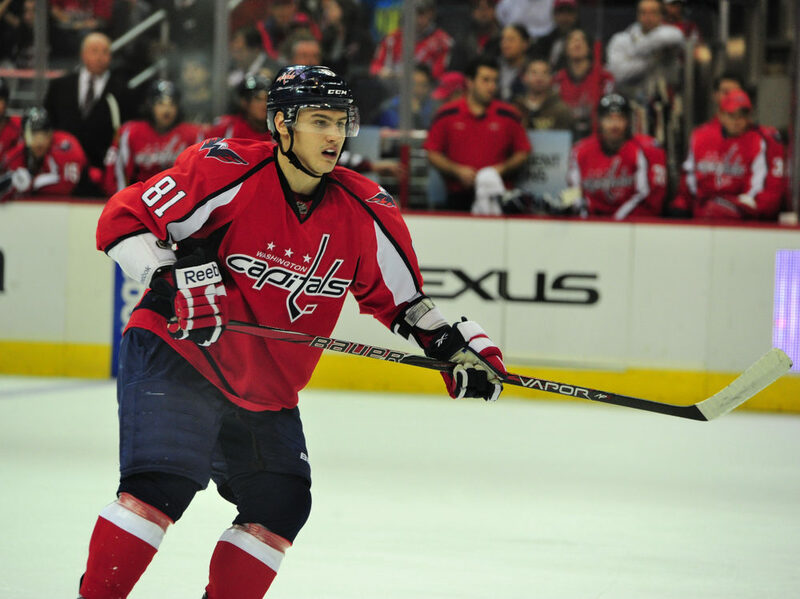 Orlov is a skilled offensive player with a booming shot who recorded 3-8-11 for the Caps in 54 contests in 2013-14. Still, Green led all Caps defensemen in power-play scoring with 17 points, set up Ovechkin more than anyone else and frankly quarterbacked the unit more smoothly than the other two. So it may take time for Washington’s power-play unit to gel in 2015-16, but the analytics and trends suggest that by the end of the year the Caps should be just fine without Green. But what about the club’s third defensive pairing? There’s no way you can replace a talent like Green in the number-five slot, right? Right. Well, maybe. Oh, perhaps we should take a closer look. How Will the Schmidt-Orlov Pairing Fare? In his postseason press conference and subsequent media teleconferences Caps General Manager Brian MacLellan indicated that a couple of 24-year-olds, Orlov and Nate Schmidt, will hold down the final pairing entering the season. Both have shown that they can play at the NHL level. Schmidt played the first half of last season as part of D.C.’s third pairing, mostly with Green, and his 54.2 percent even-strength shot-attempt rate ranked second among all of the team’s players who skated at least one-third of the regular season. He fell out of favor with head coach Barry Trotz for some careless turnovers, was scratched and ultimately sent to AHL Hershey before suffering a shoulder injury that effectively ended his season. In 68 career NHL appearances Schmidt has 3-7-10 and is a plus-2. 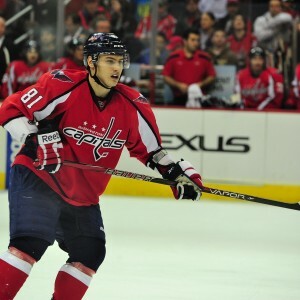 Orlov, on the other hand, already has appeared in 119 NHL games and notched six goals and 25 assists. 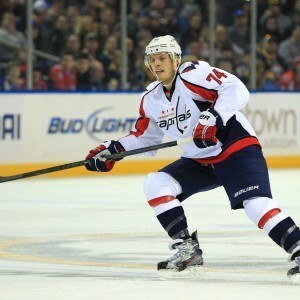 He is plus-5 for his career with the Caps and in 2011-12 recorded 3-16-19 in 60 contests. Both players skate and move the puck well and have an offensive upside. Orlov has contributed more offensively during his NHL tenure, but he also has played almost twice as many games as Schmidt, who figures to contribute more offensively as he gains experience. Could one of them replace Green alone? Probably not. But both of them together should eventually develop into a more effective duo than Green and Tim Gleason, Washington’s third pairing after the trade deadline and in the postseason. Schmidt and Orlov both are more mobile than Gleason, which will allow the pair as a unit to cover more of the ice, and their combined puck-moving ability will make the Caps a tough team to bottle up when they are on the ice together. On top of that they both have enough offensive ability to pick up some of the slack that will be created by Green’s departure. And if playing those two lefties together doesn’t work out, right-handed former second-round draft pick Madison Bowey could make enough of a push to get a serious look in training camp. So when you look at the Caps’ mixture of veterans, youth and prospects on the blue line, the organization appears to be in great shape. Let’s face facts. Mike Green will be missed in D.C. By all indications he was a great teammate and a wonderful ambassador for the Caps in the community. He is one of the smoothest-skating defensemen in the world and quarterbacked a power-play unit that has been one of hockey’s best since 2007-08. “Game Over” Green had a penchant for scoring the big goal or making that one extra pass to give a teammate a clear look at the net. Talent like that is not easy to come by, but at what price when defensively he really didn’t excel until dropping to fifth on the depth chart? As Carlson and Karl Alzner continue to develop into elite NHL defensemen, Niskanen gets more comfortable in his role with the Caps and is allowed more power-play time, Brooks Orpik continues to lend his physical presence to the lineup and the Schmidt-Orlov pairing matures, the sum of the team’s defensive parts may surpass what the team had with Green in the lineup more quickly than many people think.